Not only can a power meter allow for deeper insights on energy usage, but can provide significant installation savings. Overtime a power meter saves you money through the cost of the meter plus the labor associated with the installation. Knowing the installed cost improves the contractor's estimate accuracy, leading to more project wins and increased profitability. Mounting a power meter can be the most time consuming part of the installation. Many competitive meters are built into a NEMA 4X rated enclosure that requires its own separate space. Creating free space and fitting conduit to the separate enclosure can take hours. Historically, split-core current transformers have been the standard in sub-metering applications. Any contractor who has installed a split core CT around a cable bundle or buss bar can attest that not only is it time consuming, but can be extremely difficult. Setra’s Patrol Flex Rogowski coils provide the contractor a flexible CT that is easy to install around any cable bundle or buss bar. The Power Patrol also has three-phase verification LED’s, providing visual indication that the CT is wired properly, which can be a monumental time saver while troubleshooting a difficult installation. The last step is to ensure that the unit is powered up and communicating with the building automation system or controller. Most other sub-metering manufacturers require preselection of the type of communication when ordering. If the wrong configuration is ordered, the contractor must return to the site another day with the right meter; as every contractor knows “call backs break the bank”. The Power Patrol offers BACnetMSTP, BACnetIP, ModbusTCP, Modbus RTU, and digital pulse output all in one unit, providing insurance and peace of mind that the contractor will have the right meter for the job. During a recent time study against two leading power meters, the Power Patrol saved the contractor over 45 minutes per metering point on average, reducing installation time by over 50%. The project bidding process has never been more competitive; selecting the wrong meter or configuration can put a project into the red. Choose the Power Patrol and we’ll prove to you how we can save you time on installation and increase profitability. Save time, save money, and simplify your job. 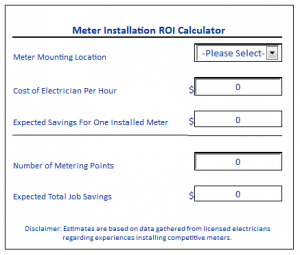 CLICK HERE to calculate your own installation savings through our interactive ROI calculator.